Through a vision of beauty and perfection, Kaufmann de Suisse jewellers brings to life remarkable jewellery designs that reflect the spirit of the times we live in, the sophistication of beauty stirred by nature, and the ethereal inspiration of the soul. Its jewellery is renowned the world over for combining the complex with the simple, the extraordinary with the everyday, and for adorning each masterpiece with the finest quality gemstones available. Founded in 1954 by Swiss born Montrealer, Emil Pius Kaufmann, Kaufmann de Suisse is esteemed for its reputation of integrity and is regarded with respect by the elite of the international jewelry community for its adherence to the highest production standards and for the winning of the industry’s most coveted award no less than five times – the Diamond International Awards for Excellence in Jewellery Design. Today’s Kaufmann de Suisse is a vibrant, dynamic entity, embracing the younger generation by integrating new ideas and artistic expressions, and by continuously evolving its interpretation of beauty inspired by nature, with its “Flowing Lines” design. Proud of its Quebec and Canadian origins, Kaufmann de Suisse is the only family-owned Canadian jewelry manufacturer and retailer to have expanded internationally and now count three impressive locations to its name – the inviting and tranquil Crescent Street showroom in Montreal, the luxurious boutique on Worth Avenue in Palm Beach, and the prestigious New York salon on Madison Avenue, each with an in-house jewelry workshop housing a world-class team of master jewelers. The firm’s 50th Anniversary occasioned the introduction of two new editions of its celebrated Flowing Lines style. Each of the new collections, Cascade and Nouveau, exemplifies its own unique blend of sophistication and ethereal beauty, appealing to a new generation of lovers of the finest of fine jewellery. At the same time, the Art Deco and Art Nouveau influences that instigated the creation, and that radiate throughout the Flowing Lines style, will continue to delight. Kaufmann de Suisse’ faithful commitment to this signature collection ensures the lasting value and recognizability of Kaufmann de Suisse jewellery. In fact, each piece is a limited edition, handmade work of art, created in one of its three North American on-site workshops. Through his dedication, his talent and his love, Emil Pius has succeeded, though example, of passing on his passion and his love of fine jewellery making to all three of his children – Christopher, Charles and Moneca. The following catalogue is presented as a tribute to our loving and devoted father and as a commemorative depiction of the outstanding dedication and beauty created by a very resolute, artistic and visionary man in celebration of his life’s work. We wish to express to you, Dad, our love, our gratitude, and our hope of following in your steps in a way that will always make you proud. Thank you for being our teacher, mentor, and our loving father. Here’s to you Dad! The roots of Kaufmann de Suisse can be traced back to a 14 year old Emil Pius Kaufmann. In 1942, with WW2 raging through Europe, the life of the young son of a Swiss carpenter, took a dramatic turn when he suddenly came face-to-face with his destiny. At the tender age of fourteen, and with the guidance of a sensitive school counselor, Emil Pius Kaufmann fell in love with precious stones and the art of jewellery making. This mystical art form transformed his life and provided the foundation and the driving force for a path filled with love and achievement for Emil and everyone his life has touched ever since. Today, in 2005, 63 years later, the love affair continues unabated. One of twelve children, Emil’s days were spent like those of his neighbours, doing his share on the farm. Life was not easy and every hand was needed to keep the family safe and healthy. Diamonds and precious stones were the stuff of a magical, imaginary world, not accessible to a farm boy, but as the youngest of seven boys and the champion of his five doting sisters, Emil was a diamond in the rough himself. Thriving in the woodland surroundings of a small community of farmers in the Swiss countryside near Saint-Gall, where he was born, he found inspiration in the natural beauty of the farmland and wildlife. His free time was devoted to creating sculptures and models from the scraps of wood left over from his father’s carpentry, and so the artistic and promise of his future career gestated. Emil found beauty and wonder everywhere he looked and he began to see works of art all around him. Everything that he touched became the substance of a child’s wondrous imagination and he would spend hours at a time bringing into reality the artistry he saw in his mind’s eye. This ripe childhood imagination and the industrious expression he gave it grew into his life’s passion – the creation of luxurious and transcendent jewelry. My boy, you will be a jeweler! jewellery, and to understand each material that he encountered, fanned the spark of genius which had flickered into existence with each wood scrap he had transformed into a work of art as he sat transfixed in the corner of his father’s carpentry studio. Given inanimate blocks of metal, under the master’s supervision, bronze sculptures of ingenious artistic design were coaxed by Emil from the willing material. creative achievement possible to a jewellery artist – to set the world on fire with the love of the pure beauty that only the highest quality craftsmanship of fine jewellery can reveal. renting a room on the second floor of 1466 Drummond Street. Here he invested every penny of his savings to create his own small workshop, unfathomed by the risks and challenges he was about to embark on by branching out independently. Finally, he was master of his domain – and he installed a sign over the door that read: “Kaufmann, Jeweller”! Here was the tangible evidence that all his diligence and dedication was about to bear fruit. Then, another symbol presented itself – to confirm and solidify his belief in his destiny. His first client ordered a golden key, and Emil saw this as a sign foreshadowing the key to his own golden future, a symbol of his ultimate destiny – the key opening the doors to success. A year after beginning his new enterprise, the young jeweler had created 12 pieces. While his clients’ reactions affirmed his confidence in his craft, a strong conviction took hold of Emil. He came to the conclusion, that while one can realize ones dreams on ones own, sometimes two minds make an enterprise doubly creative and successful. A former Birks colleague, Thomas Primavesi, an Austrian and fellow European, began working with Emil and, in 1955, the two young jewelers merged their talents and formed Primavesi & Kaufmann. Before long the duo was crafting remarkable creations that quickly became the talk of the town. At first, the fledgling company struggled. Acquiring gold and precious stones is quite expensive, and keeping the bills paid each month without fail was a challenge. The partners refused to be discouraged. They stuck to their convictions and continued to craft their unique pieces by hand. They knew their hour of recognition was near, and they reveled in their collective creativity. 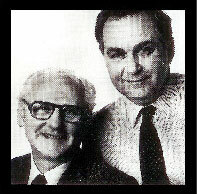 Their partnership would last for more than thirty years. Word of mouth quickly spread and soon Primavesi & Kaufmann was the pre-eminent jeweller in Montreal. Not one to rest on his laurels, however, Emil wanted the recognition of the whole world. So in 1956, instigated by his capricious youth, unbridled ambitions and forceful convictions that to be truly successful, one’s talent must be recognized at the international level, he threw his hat into the ring and competed to win the most difficult title a jeweller can hope to attain: the coveted Diamond International Award. It was his first entry into a competition and from thousands of jewellers competing world wide, his masterpieces won the recognition Emil so longed for, leading him to became one of the Diamond International Award winners that year. This was just the beginning. Emil would have much more cause to celebrate in the years to come. Year after year, every time Emil competed internationally he was consistently honored as one of the most talented and innovative jewelers in the world, winning 5 Diamond International Awards, and culminating with the medal of the Academy, the highest distinction a jeweller can achieve. At that point in his career, Emil had been receiving praise from magazine articles; his work was displayed at the 1958 Universal Exposition in Brussels, at London’s prestigious Modern Jewelry Fair, at Expo 67 in Montreal, in Johannesburg, and in Chicago. Emil was in the prime of his career and on top of the world. The only thing missing was someone with whom he could share his success and achievements. …and the love of his life! Finally, Emil Pius fell in love for the second time in his life, and this time it wasn’t with jewels – this time it was with a human jewel, a charming young lady named Eva Charlotte Reyburn. Eva and Emil won each other’s hearts and married six months after their first meeting! 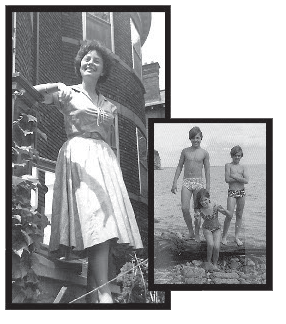 It was the early sixties, and Eva and Emil would go on to have three children. When asked what they remember of their childhood, their children speak not only of exquisite jewelery (a staple of the family dinner-table conversation!) but of family vacations all over North America, fun-filled camping trips, long walks, inevitable outbursts of contentious competition and constant boisterous explosions of laughter. Emil made sure his kids experienced where he had been born and raised. Every two years the whole family headed for Switzerland where they saw with their own eyes where he had gained the inspiration for his life’s work. Emil involved his children in his passionate love affair with jewellery. 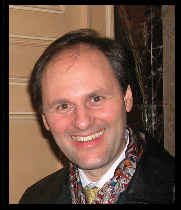 He did this so successfully that all three of his children have become an integral part of the Kaufmann de Suisse legacy. By the time Emil’s thirty-three year partnership with his colleague came to an end, in 1988, his children had already grown into successful, independent professionals well suited to their roles as trusted members of the family business. They were able to embrace each other’s differences and cement their similarities to work together with their father to rebuild, restructure and give birth to a new and improved manifestation of his lifelong creative mission – each with their own place in the new Kaufmann de Suisse enterprise. Christopher and Charles, both happy and accomplished jewellers at forty-five and forty-two respectively, chose jewelry as their careers during their adolescence. Emil put the cards clearly on the table for his sons: “it will not be as difficult for you as it was for me, but one thing remains the same: if you want to be a jeweller, you have to go to school and train to be one!” So, at around the ages of fifteen, the two boys attended night-school training so that they were available during the day to work in the family boutique. In the old master-apprentice tradition and under Emil’s watchful and exacting gaze, they discovered the world of precious stones and learned how to create fine jewellery to their father’s exacting standards. They also learned from him the art of being able to accurately listen, observe and interpret the client’s wishes for a custom made piece. At the core of the Kaufmann de Suisse modus operandi is the desire to invest the time and to really focus in on the client’s wishes so that the piece is a reflection of that client’s dream and who they are. In Geneva, Switzerland Christopher merged his knowledge of high-end jewelery with his accomplished salesmanship and became the Store Manager of a decades old enterprise. After 4 years of achieving tremedous success, he returned to Montreal confident in his abilities and ready to take on the challenges of the industry and the family business. Charles, too, quickly made his mark, creating extraordinary contributions for reputable companies such as Schoenhaus & Pasquiet and Bucherer, until the day when Emil let him know that his longtime business partnership with Thomas Primavesi was coming to an end, and asked him to return to Canada and take his place, so that the united family’s name could shine in golden letters for all of North America to see. Moneca followed a different path. While the brothers learned the jewellery trade under their father’s paternal direction and wisdom, Moneca worked as a financial analyst and portfolio manager in Switzerland, and then earned an MBA. How do we create a jewelry piece? Each piece of Kaufmann de Suisse jewellery is created with with great passion, and the energy to do this is inspired by a great love for making the finest. Our creations are available exclusively in our three boutiques and we create to satisfy your heart’s desires. artistic heart. Inspiration is found in a moment’s flicker. Once set in motion, inspiration triggers the sketch, in a few strokes of the pencil or with painstaking effort over hours or days. It is not thought about, but executed. It is done through inspiration, and is a feeling, from deep inside you. Intricate modeling precedes each new design. The most malleable of all metals, silver, is best for the most complex jewelry pieces. Each model is melted and tailored, and sometimes first sculpted in wax or completely redone or reworked before the silver is poured. The model must be perfect before it is ready for the mold. Two layers of rubber sandwich the silver model and are heated under pressure to 160 degrees Celsius. Under this heat and pressure, the rubber melts and takes on the form of the silver model between it. After the rubber cools off, it is removed from the press, and is cut in half with a surgical knife to remove the silver model. This step requires perfect precision so as to retain the fine details of the model in order to be able to use it for further impressions. The next step is to spray liquid wax into the rubber mold and following a cooling period, the two shells can be separated and a perfect wax impression of the silver model springs forth from the rubber mold. Making a piece of jewellery is often composed of many parts, and so a little tree of all the parts can be build out of these wax models to facilitate a larger production. Once the tree is ready, it is placed in a cylinder filled with liquid plaster, the “investment mixture”. Under vaccum, any possible air bubbles are removed to allow a finer end result. The cylinder with the hardened plaster is placed into a furnace that is heated to about 1300 degrees Celsius, allowing all the wax to drip out of the plaster cylinder leaving an empty space – the ‘negative’ of the jewelry part under construction. The cylinder is now placed onto a vacuum pump. The gold is then melted in a ceramic cruxible with a blow torch and on becoming liquid, it is poured into the cavity or negative within the plaster, all the while keeping the plaster cylinder under constant vacuum so as to enable the gold to fill the tiniest channels, ensuring maximum results. As soon as the gold cools off, the plaster is broken and removed in cold water – resulting in miniature golden tree! Assembly is the next step and the longest. 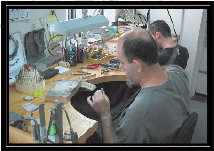 It is here that the skill of the goldsmith comes to life. His work requires attention to the finest details, while he delicately files, cleans, polishes and solders the pieces together, working with meticulous precision. After completing this process, the piece begins to come to life, and is now ready for its final crowning. The precious stones are strategically placed on to the piece, so as to best display their beauty and sparkle and colour. The work demands absolute perfection. 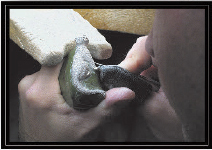 It is detailed and challenging and the master entrusts him with very valuable stones to set. With a final cleaning and polishing the piece is complete and ready to delight. 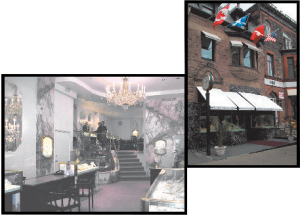 Home to Kaufmann de Suisse since 1988, the family owned building on Crescent Street presents us with a jewel of a boutique, a tranquil place of beauty and serenity amid the hubbub of downtown Montreal. Designed by E.P. 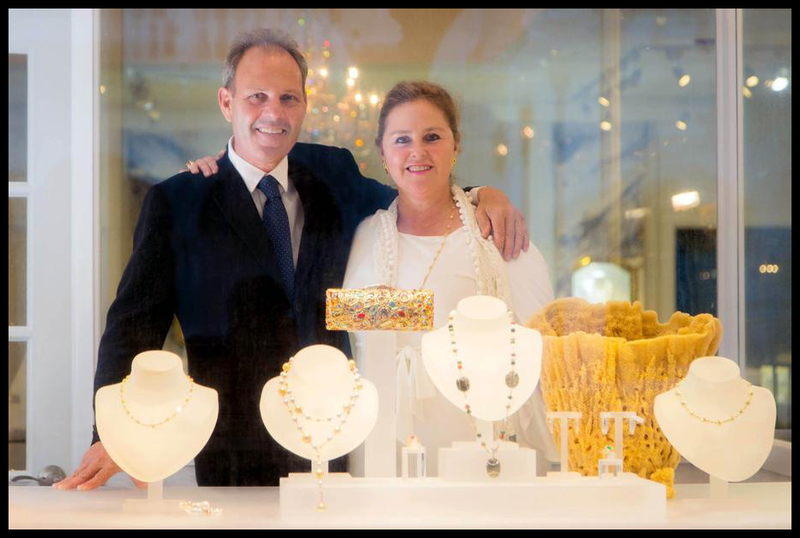 Kaufmann himself, the boutique boasts the same artistry as his jewelry: perfection with a crystal clear grasp of aesthetics. Managed by daughter Moneca Kaufmann, and the workshop still supervised by E.P. Kaufmann, the Montreal boutique stands its ground as the flagship of Kaufmann de Suisse. Serving champagne, and cigars with your ‘special’ purchase, surrounded by Turkish Marble, a private viewing room, and a flowing fountain symbolizing the “Flowing Lines” motif, the boutique conveys an aura of refinement and a sentiment of experiential luxury. – a delight waiting to be stepped into. Kaufmann de Suisse is the only company in Quebec to carry the exclusive Patek Philippe watch brand. Today, Emil’s son Charles owns and operates the Montreal store. The Palm Beach boutique was opened in 1994 and has become the most successful of the three locations. Also designed by E.P Kaufmann, the Palm Beach store has the same transcendent feeling of space and good taste, and, as the Montreal and New York boutiques, is equipped with Turkish Marble, and a symbolic, flowing fountain. Celebrating its 10th Anniversary, the boutique’s success shines as brightly as the Florida sun, its jewellery all the more radiant, expressive and intimate in the tropical climate of this beautiful beach side resort. Today, Monica Kaufmann owns and operates the store. Her brother works under her supervision. Every Kaufmann de Suisse jewellery piece is brought to life in our three workshops located alongside our boutiques. Every piece is handmade, numbered and signed, ensuring our customer that the work has lasting integrity. Each master goldsmith has been trained personally by Emil Pius Kaufmann in the Master/Apprentice tradition, some of whom have been with us for more than two decades. We create all of our jewellery here, as well as rework and refurbish older pieces. Each and every work that is carried out must meet our high standards, and all pieces are checked meticulously by the resident Kaufmann. Along with the refined jewellery, Kaufmann de Suisse brings a refined sense of values. We stand steadfast behind our products and demand of ourselves total customer satisfaction. As the Kaufmann’s say: “We are eager to rework a piece if need be, and we also have a generous policy of exchanging pieces if our customers are not content with their purchase. For customers wanting to upgrade a diamond to double the size of the first they purchased with us, we offer them a full credit of the original amount spend with us towards this upgrade.” Kaufmann de Suisse delights in creating the perfect piece for you, customizing it according to your desires so your own expression is incorporated into your unique jewelry. You don’t simply purchase a piece with us, you become part of our Kaufmann de Suisse family. High-end, high standards, elegance and sensuality and an impressive selection of necklaces, bracelets and rings in our signature “Flowing Lines” design with single or double lines in white or yellow 18 karat gold, adorned by our famous diamonds is what we are known for. Purchasing directly from the manufacturer you get your money’s worth – our precious stones are of only the highest quality. We will help you choose the best stone for the occasion; diamond, ruby, emerald or sapphire, classic or modern. Kaufmann de Suisse has a strong bond to the community it emerged from. From donating to 29 different charities, to providing pieces and locations to the film industry, to sponsoring sports events, to designing special corporate emblems, we try to incorporate ourselves into people’s lifestyles. We involve ourselves with our customers on a personal level: we want them to dream for us so we can dream for them, and pass on a Kaufmann de Suisse piece made from their inspiration. We will do nothing less for our distinguished clientele. When the family business celebrated it’s 50th Anniversary in 1994, Monica Kaufmann made a 50th Anniversary catalog as a tribute to her father. The images above were taken from the catalog that was produced in the early days of personal computers. “The following catalogue is presented as a tribute to our loving and devoted father and as a commemorative depiction of the outstanding dedication and beauty crated by a very resolute, artistic and visionary man in celebration of his life’s work. We wish to express to you, Dad, our love, our gratitude, and our hope of following in your steps in a way that will always make you proud. Thank you for being our teacher, our mentor, and our loving father.